This plaid shirt is cut in the western style, with pointed breast pocket flaps and diamond snaps instead of buttons. The plaid on the pockets, shoulders, and around the buttons, runs diagonal. In Children Shouldn’t Play With Dead Things (2x04), Sam wears it from the beginning of the episode until he confront Dean in the motel about how it’s not really a case and Dean just has issues. When we see him next (watching Casa Erotica), he has changed out of it. In The Magnificent Seven (3x01), Sam wears it for the first half of the episode, he changes out of it before the stake-out at the bar. In Lazarus Rising (4x01), Dean borrows the shirt after reuniting with Sam. Dean changes into it after Bobby leaves to call Pamela and Dean tells Sam that he doesn’t remember hell. He wears it for the rest of the episode. It makes a very brief appearance in It’s The Great Pumpkin, Sam Winchester (4x07), when Sam has it laid out on the bed waiting to be stuffed into his backpack. In Fallen Idols (5x05), Sam wears it the day after he is attacked by Ghandi until after he kills Paris Hilton (excluding the moment when he is briefly in a suit to interview the two teen girls). 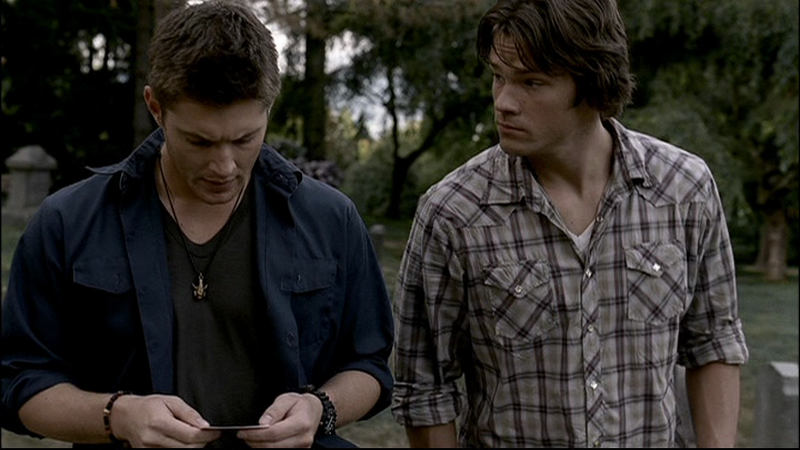 In Unforgiven (6x13), we see that Sam wore this shirt when he and Samuel were first in Bristol. He wore it while they discussed the case at the restaurant, when they used the Sheriff as bait, and when they left town afterward. In Hunteri Heroici (8x08), the shirt makes its reappearance! 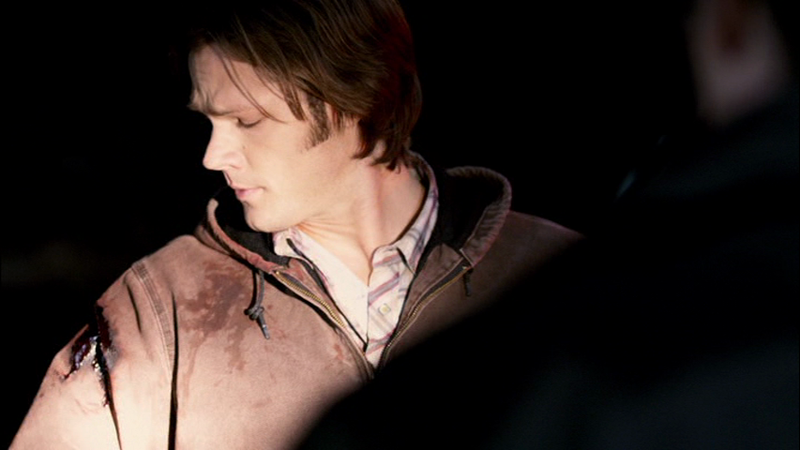 Sam wears it in the first scene with the Winchesters and Castiel at the Gas’nSip. In Everybody Hates Hitler (8x13), Sam wears this shirt when he, Dean, Aaron, and the golem break into the library and Sam is attacked by the necromancer. 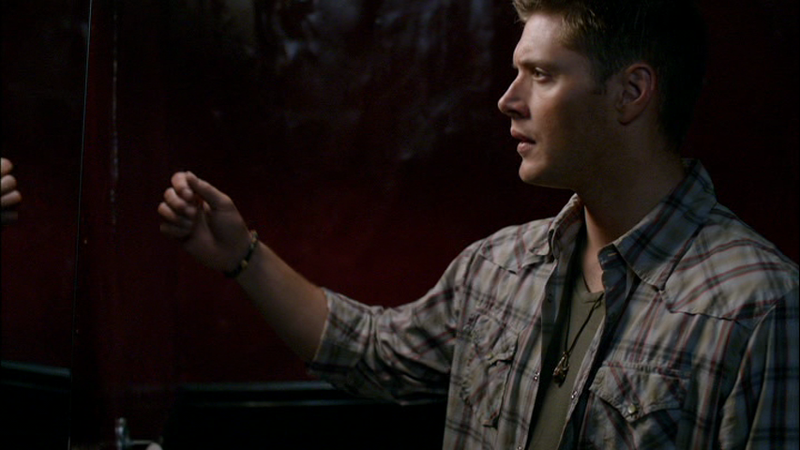 In About a Boy (10x12), this is the shirt Sam is wearing when Dean returns to the motel room after having been cursed. Sam wears it until they kill the witch and rescue the girl. In Don’t You Forget About Me (11x12), Sam wears this shirt at the end of the episode when he says goodbye to Jody and the girls. In The Foundry (12x03), Sam wears this shirt at the beginning of the episode when they’re in the Bunker, he keeps it on for the beginning of the hunt, taking it off only after they check out the house the first time. In There’s Something about Mary (12x21), Sam wears this shirt at the beginning of the episode when he and Dean search Mary’s motel room. I'm not normally into clothes, but it's really fun tracking the sartorial history of Supernatural!